A little bit of North Korea comes to State College, Pennsylvania. “Are you here to take part in hagiography?” he said. It seems that Reilly owes that “jealous egghead” an apology. This makes you wonder how many other people ignored warnings that Paterno wasn’t what he appeared to be. Or how many people were ignored, who argued that maybe it wasn’t a good idea to shower so much adulation on a man who was merely coaching a football team. “What you media are doing is dangerous.” It was dangerous, and it eventually blew up in people’s faces. When the Penn State Board of Trustees rightly fired Paterno, students rioted on campus. Look at the comment threads on sports blogs, and you will find that some people are still in a state of denial about what Paterno did. All this is simply madness. If there is one thing that life teaches us, it is that if something seems too good to be true, it probably is. Joe Paterno, we were told, built a winning college football team while managing to remain completely principled. Yeah, right. 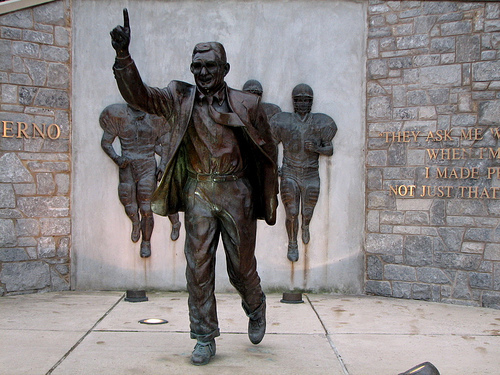 In recent years, it became obvious that Paterno was coach in name only, yet people played along with the pretense, because the myth of Paterno had to be maintained at all costs. And now we know just how much it cost. This entry was posted on July 15, 2012 at 3:56 am and is filed under Education, Journalists, Media, Sports. You can follow any responses to this entry through the RSS 2.0 feed. You can leave a response, or trackback from your own site.